Have you heard of Floribbean cuisine? 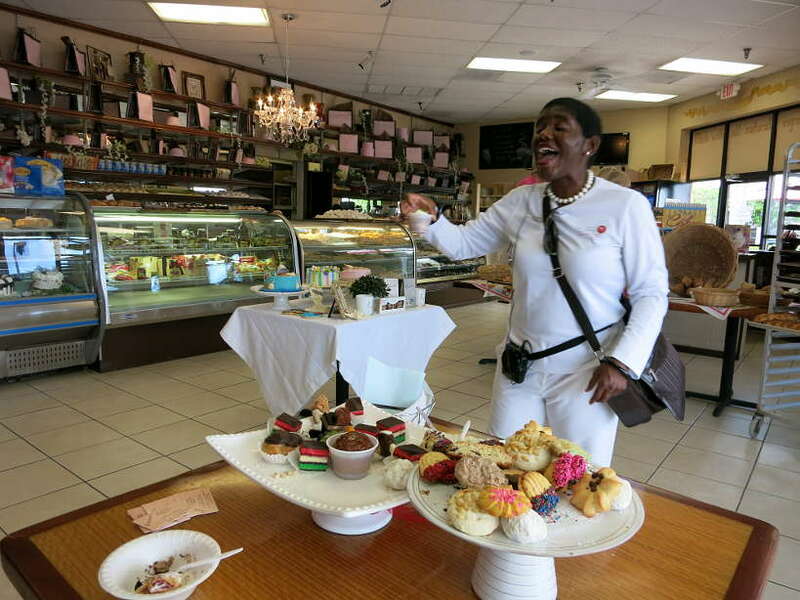 Neither had we until we took a Taste History Culinary Tour of Historic Palm Beach County. Floribbean, we learned, is a “portmanteau”, a combination of two words, Florida and Caribbean. No doubt you’ve heard of dishes like key lime pie, conch fritters, mango salsa, various types of rice and bean dishes, arroz con pollo (chicken with rice), jerk chicken, and certain seafood gumbos and salads. These are all part of Floribbean cuisine. 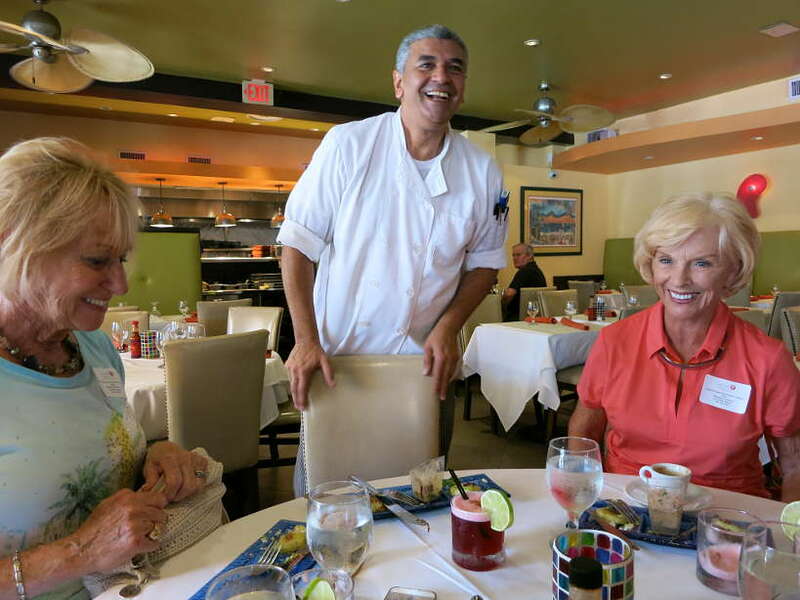 Floribbean cuisine represents cuisines that evolved in Florida, migrated to Florida or immigrated to Florida. 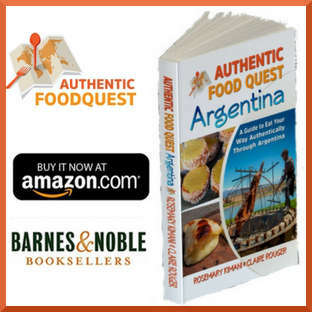 The cuisine takes the elements from Latin America, the Caribbean, Africa, Europe and Asia. The roots of Floribbean cuisine can be traced back to the exploration of the New World by the Spanish. Today, the cuisine is popular in South Florida and slowly making its way into mainstream America. 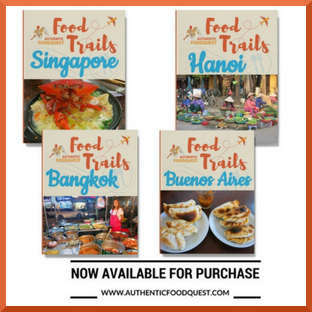 We heard about Taste History Culinary Tours from our friend Vicky, who writes at Buddy The Traveling Monkey. When she told us the tours focus on local foods at off the beaten path restaurants we were immediately intrigued. In this article, we take you on a culinary journey through Delray Beach and Boynton Beach, Florida. 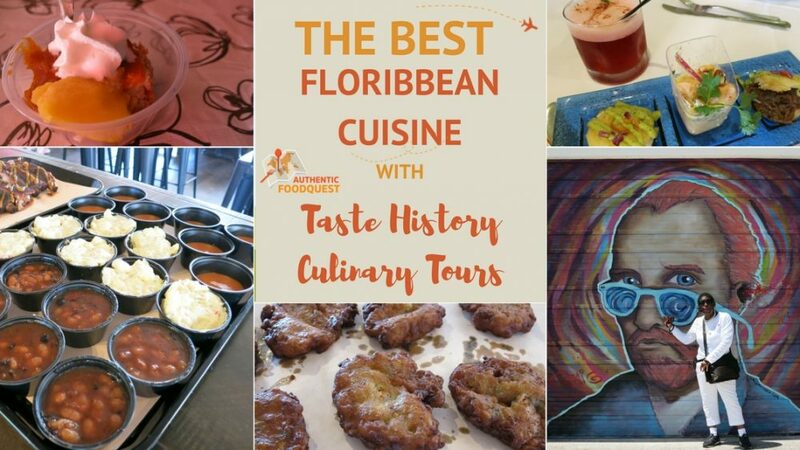 Join us and discover Floribbean cuisine and the emerging local art scene. Taste History Culinary Tours is a non-profit organization and the educational program of the Museum of Lifestyle & Fashion History. Lori Durante, the Executive Director and native of Florida, runs the historical and culinary tours and is a wealth of knowledge. Three different tours are offered – West Palm Beach, Lake Worth & Lantana, and Delray Beach & Boynton Beach. In general, the tours cover about 500 years of Florida history, punctuated with visits to emerging arts districts and off the beaten path local restaurants, featuring cuisines that have shaped the Florida culinary landscape. Tours are held year-round on Saturday’s and last about 3 to 4 hours. The tours are a combination of bus riding and walking. At least four to five local and family owned restaurants are visited as well as three to four emerging art galleries and art districts. We met our tour guide extraordinaire Lori, and the tour bus at 10:45 am in front of Macy’s at the Boynton Beach Mall to begin our culinary adventure. It was a small intimate group with a group of four ladies who had recently relocated to the South Florida area. On the way to our first stop, and in that time, Lori gave us a brief history of the area. We learned about the arrival of the Spaniards to Florida, the pioneer Seminole Indians and African-Americans, the early White settlers and the development of Boynton Beach. 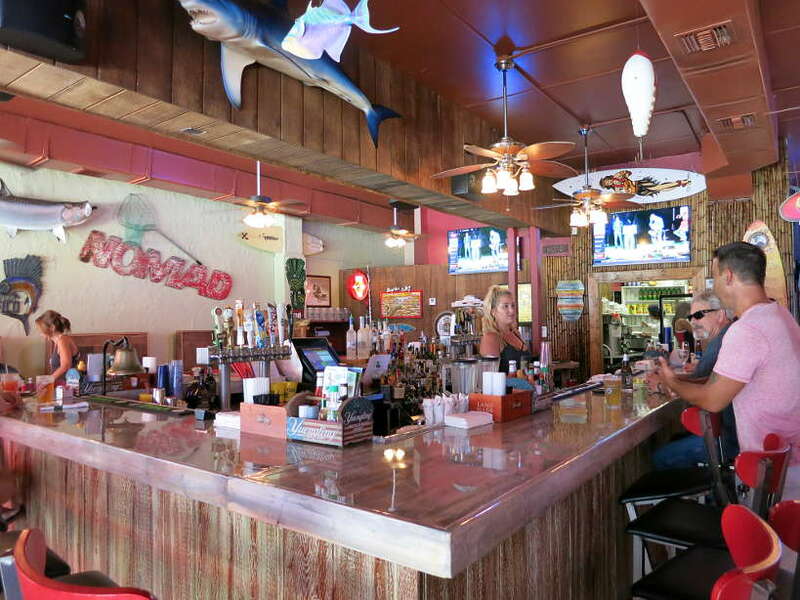 The first tasting was at a local seafood restaurant in Downtown Boynton Beach, on the Avenue of the Arts District. 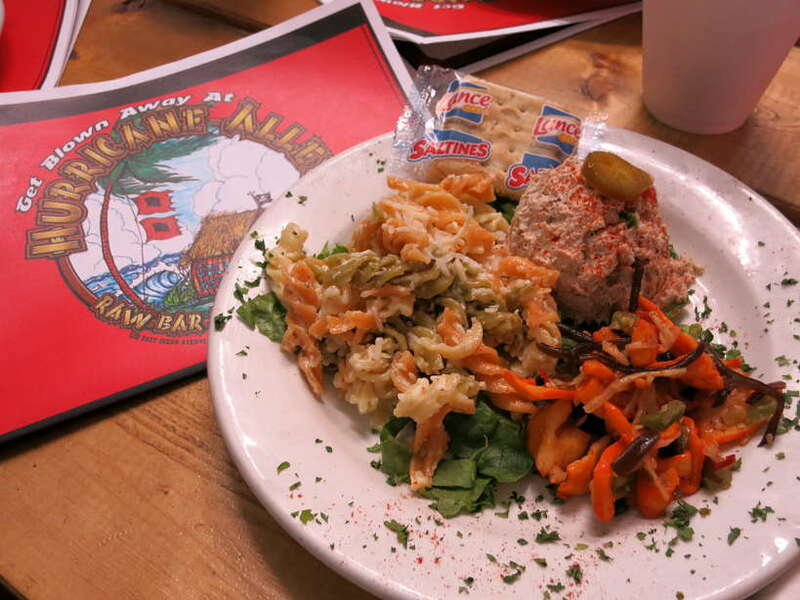 Hurricane Alley Raw Bar & Restaurant combines an eclectic decor with fresh seafood. Their specialty is the smoked tuna dip that is smoked in-house. Served with the dip was a calamari seaweed salad with tricolor pasta and a seafood bisque. The food was really fresh and tasty. 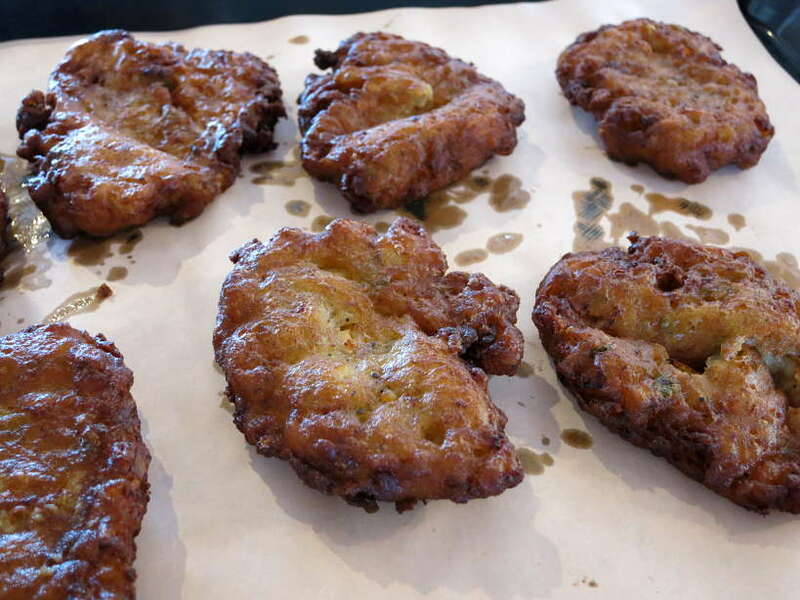 In addition to the local seafood, they have a few signature Floribbean dishes such as Conch fritters or fried shellfish cakes. We had to wait for our next stop to try this shellfish dish. Hurricane Alley also can organize fishing trip for their customers on a boat called the Sea Mist. The fun part is that if you happen to catch a fish, they’ll cook it for you! We took a short stroll past kinetic sculptures on our way to the colorful Amanda James Gallery. 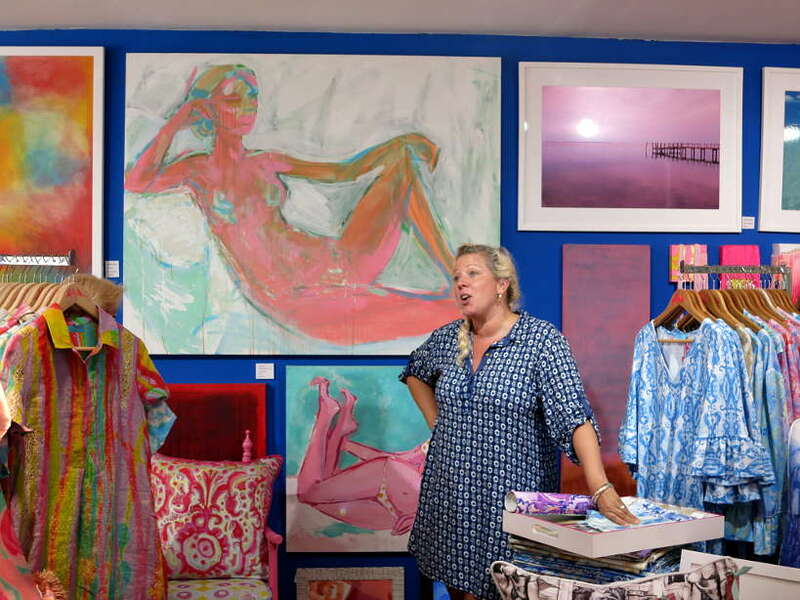 Amanda’s passion and energy greeted us as soon as we walked into her gallery. Adorning the walls and every inch of square space was art work, pillows, scarves, dresses and more. A very talented artist, it was inspiring to hear her story and commitment to the arts and the Boynton Beach community. Troy’s Barbecue, a brand new restaurant serving Floribbean style barbecue was the second food stop. We met Troy, the owner who got started cooking in his mother’s backyard for about 20 years. He told us about his grilling techniques and popularity of his ribs. He attributes his success to the consistency of his grilling. Over the years, Troy has refined and perfected his grilling technique, cooking meat slowly over charcoal using hickory and oak wood. The wood gives his meat its signature smoky taste. 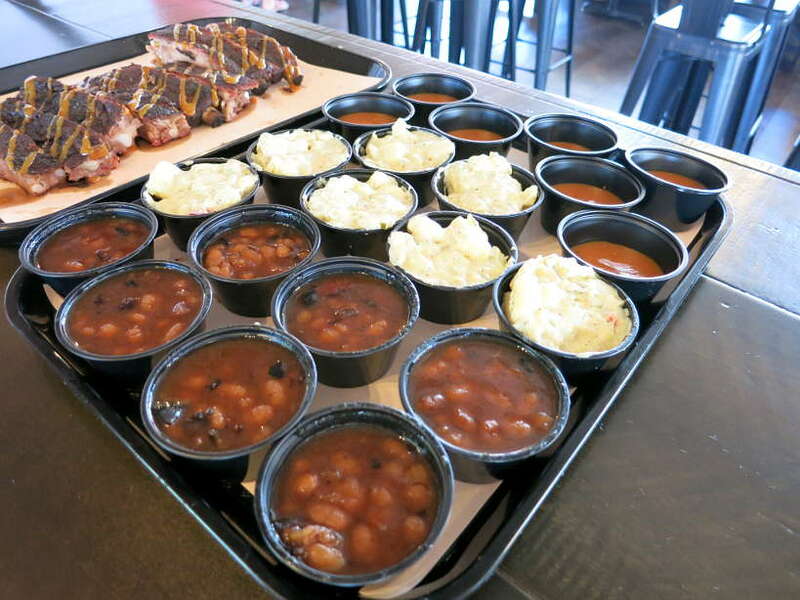 To accompany the ribs, we were served beans cooked in a sweet homemade sauce and a potato salad. The pork ribs were tender and falling off the bone. The potato salad was fresh and creamy while the beans had a sweet flavor, that was really tasty! 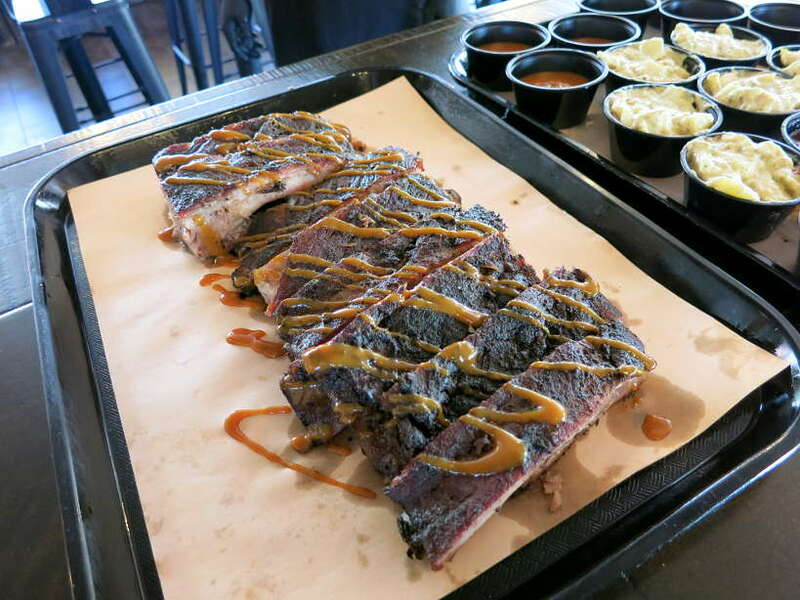 Troy also makes his own rib sauce to accompany the meat. Before we left, Troy had us taste his homemade conch fritters. We were eager to try this Floribbean specialty after our first seafood stop. This dish comes from the Bahamas, where conch, a shellfish, is mixed in a spicy batter and then deep fried before being served. Although greasy, it is truly delicious! The conch is served as a soft patty and the filling simply melts in the mouth. 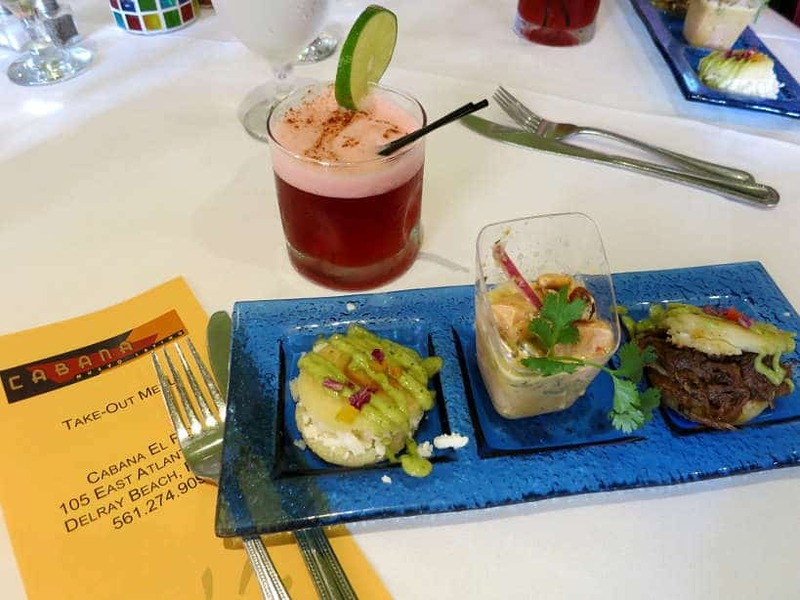 For a fusion of Latin flavors, we stopped into Cabana El Rey restaurant in downtown Delray Beach. This Nuevo Latino restaurant includes different flavors from across Latin America and the Caribbean. The staff welcomed us warmly as we took our seats around the table. The tasting kicked off with the flavors of Peru and specifically Pisco Sour made with chicha morada (purple corn). What a warm welcome at Cabana El Rey! This was followed by a sampling of flavors from Venezuela. We were each served a trio of “arepas”, which are traditional Venezuelan corn meal cakes. Each arepas had a different filling. One was filled with ropa vieja (shredded skirt steak), another queso fresco and the last one, a shrimp sofrito finished with avocado and tomatillo aioli. While enjoying the food and the break from the heat, the chef came out and introduced himself. 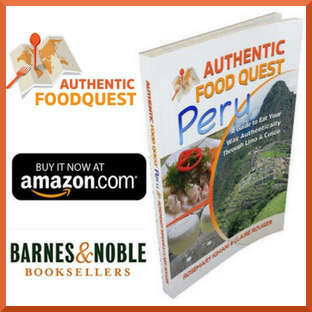 Hailing from Peru, he talked about this background and culinary journey. Friendly and jovial, we all enjoyed talking with him. 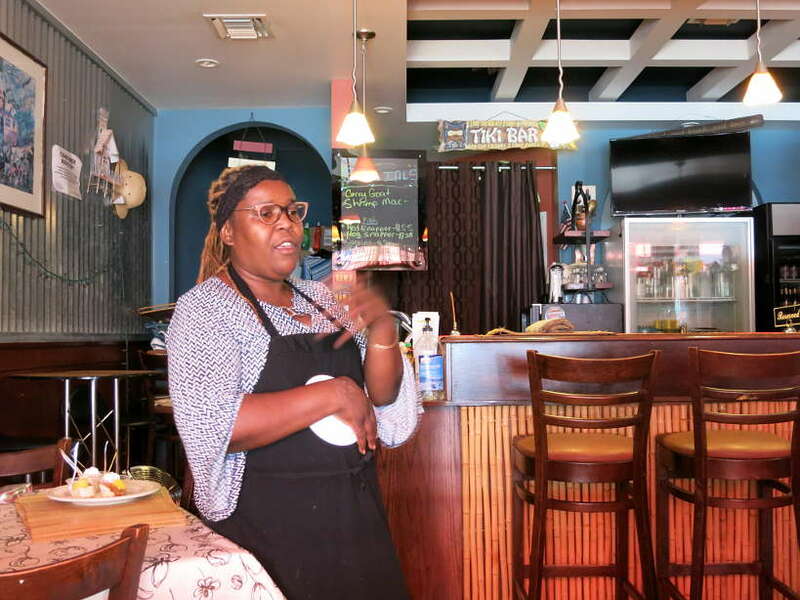 Chef Beverly and her husband Donald, own and operate this restaurant serving Caribbean cuisine, by way of Guyana, their homeland. We were delighted to discover Guyanese cuisine and learn about the history that has shaped the food in South America’s smallest country. Our tasting included the best mac & cheese we’ve ever had. Chef Beverly uses tortellini pasta, goat cheese and sweet plantains. Absolutely delicious. We also sampled her famous curried meatballs, which were perfectly spiced. The tasting ended with light and flavorful homemade cheesecake with fresh mango. Bamboo Fire Café has a cult following and is one of the best restaurants in Delray Beach. When you visit, don’t miss their award winning Calypso lemonade. The fun part of this tour is that you get to walk through different art districts in the local community. This also provides for much-needed exercise after all the copious food. It is also a wonderful way to learn about the local culture and community. 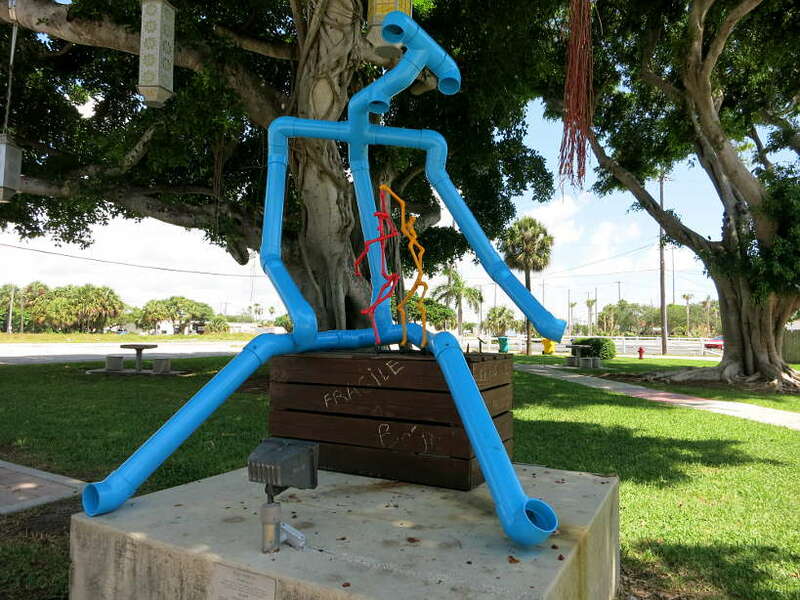 As part of the revitalization efforts, the city of Boynton Beach has designated Ocean Avenue, the “Avenue of the Arts”, a location to showcase and celebrate local art. Along the streets, several Kinetic art sculptures are exhibited. This is art that is in motion and powered by wind, light, water, gravity and other elements. The City changes the sculptures regularly featuring different artists. This keeps the area buzzing and interesting for visitors to check out the exhibits over and over again. The last art stop we made was quite surprising. 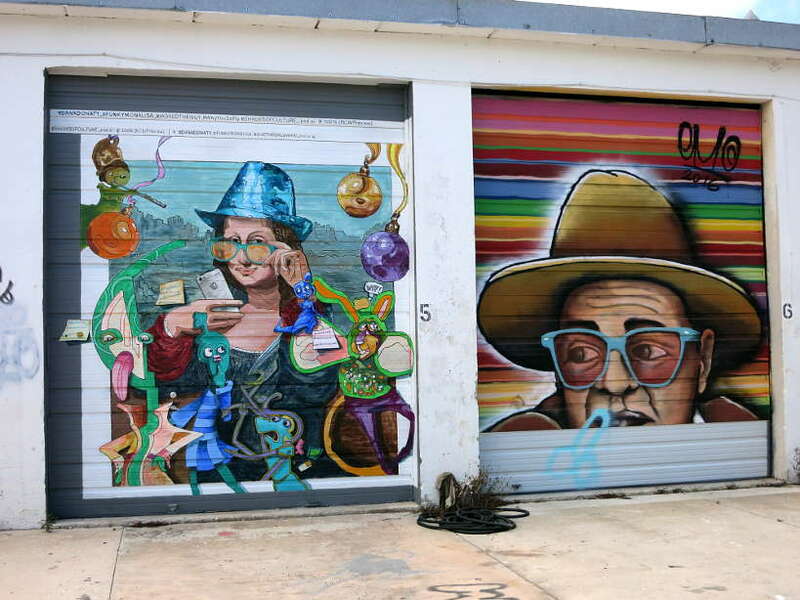 We went to an industrial district that features local artists and their art from Miami and all over Florida. The Bay Gates Mural Project is an impressive stop. The images are striking images and they breathe life to a quiet industrial zone. To put a sweet finish to our tour, the last stop was Palermo’s Bakery, a family owned Italian bakery. Palermo’s roots go back to the 1920’s when the owner’s grandfather started Palermo’s in Sicily. 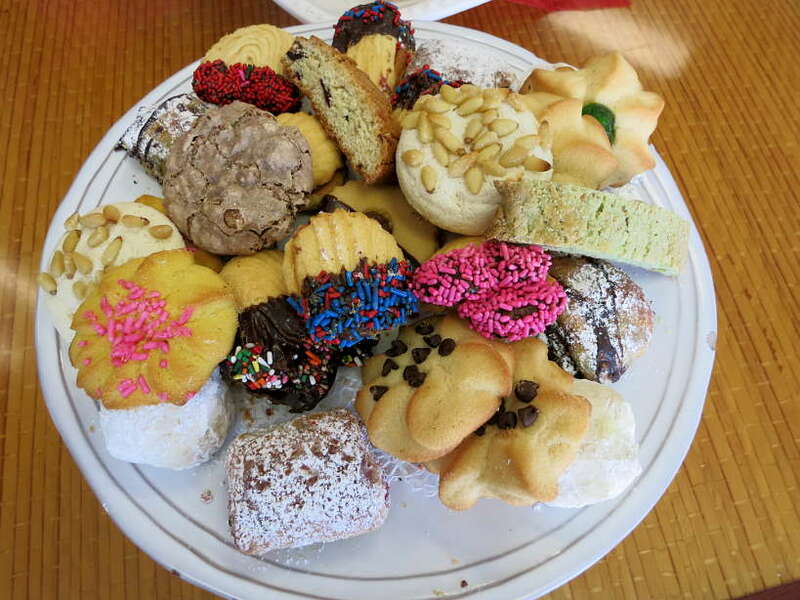 The business moved to the Boynton Beach area in 1961 and is now the #1 Italian neighborhood bakery in Palm Beach county. 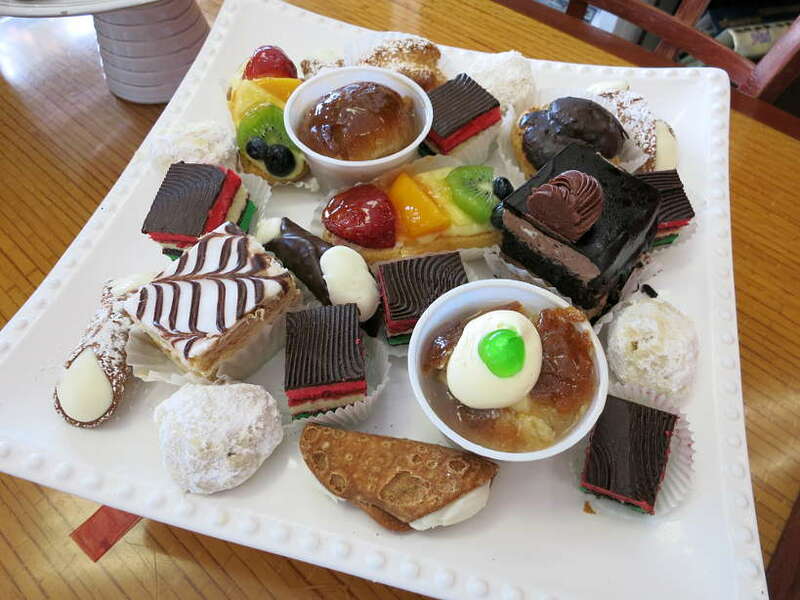 To taste the Italian influence in Florida, Palermo’s prepared a huge spread of delicious Italian desserts. From cannoli’s biscottis, panna cotta, Rhum Baba, torta caprese and more, there was more than enough for everyone. The only regret is that this was the last stop on the tour and we were all stuffed by then. Without a doubt, this was one of the most insightful food tours we’ve taken so far. The tour is chock full of information about the local history, culture, and food. Starting from the arrival of the Spaniards to the food exchanges between the natives and Spanish, you get a good understanding of the distinctive Floribbean cuisine. Eating at the local restaurants and meeting the owners and chefs was a highlight of the experience. Their stories and passion was contagious and their food delicious. Definitely, a fun way to meet the passionate people behind the food. 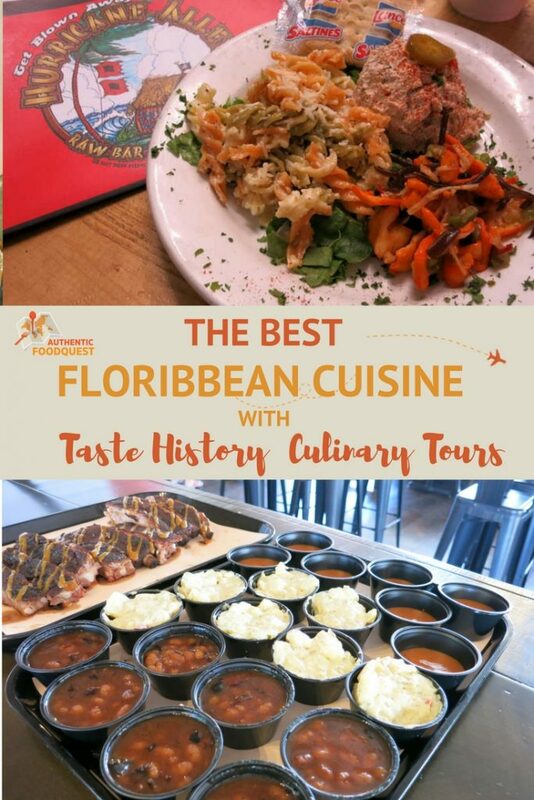 Taste History Culinary Tours is a wonderful way to get off the beaten path and learn about Floribbean cuisine and its history. Lori is a great tour guide and a wealth of historical knowledge. As a native of Florida, she knows the area like the back of her hand. For your next travels to Miami, this is one tour you must definitively take. 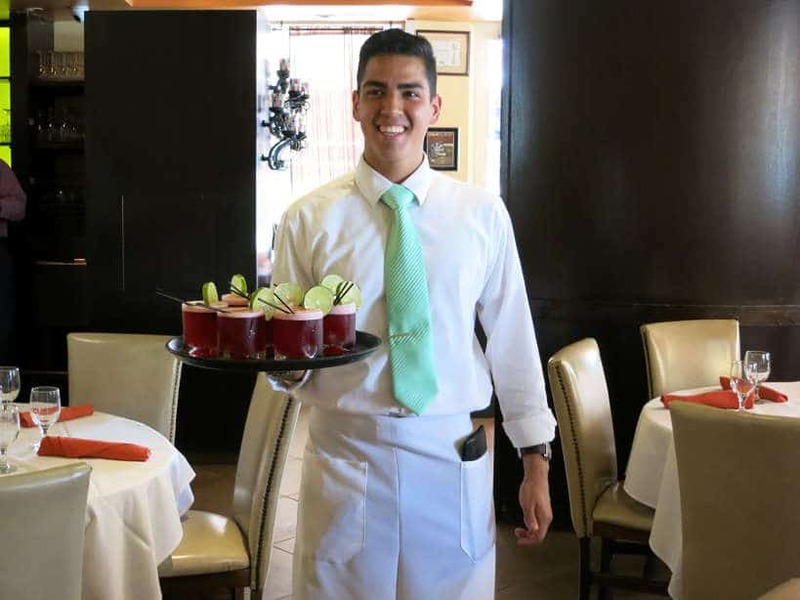 Taste History Culinary Tours offers a tour every Saturday in three different locations. You can choose from West Palm Beach, Delray Beach & Boynton Beach and Lake Worth & Lantana. location. To book your tour, click on the link Taste History Culinary Tours. Please note that the tours are very popular and are some are sold out weeks in advance. So prepare ahead! Keep in mind that the tour does not accommodate any dietary restrictions. We also highly recommend eating a very light breakfast. The portion sizes at the restaurants are generous. You will have a very light dinner if any as well! Special thanks to Taste History Culinary Tours for having us on this tour. All views and opinions expressed are our own. Full bellies and happy taste buds too! 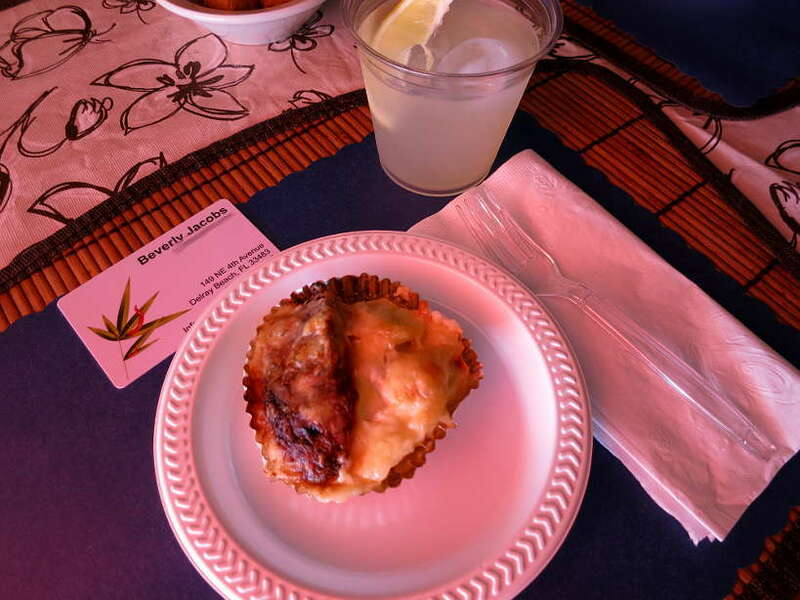 Have you had Floribbean cuisine before? In the comments below, share with us what’s your favorite Floribbean dishes! I love the idea of mixing good history and culture. Snd now I know s new word Floribbesn! Awesome to hear. Floribbean was a new word for us as well and learning about the local cultures in South Florida was fascinating. If you find yourself in the area, don’t hesitate to take one of the Taste History Culinary Tours. Thanks for stopping by! What a great tour! Food, drinks, and art? Sign me up! I love tours when visiting an area that is new to me and food tours are great. Everyone has to eat so why not learn about the community at the same time? Such a great concept. Love it….and whole heartedly agree, everyone has to eat, so why not learn about the community at the same time. 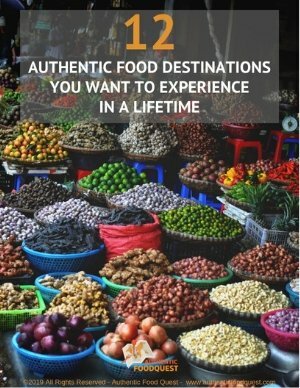 Do you have any favorite food tours before? I need to take this tour! I have friends in the Palm Beaches area and relatives further south near Fort Lauderdale. So I do get down to visit every so often. I’m a fan of eating Floribbean cuisine when I’m in South Florida. I just never knew there was a term for it! You would love the tour Erin. We met locals on the food tour from the Palm Beach area who told us they learned so much about their community. Take your friends with you and have a blast! Do come back and let us know about your experience. Thanks for stopping by. Yum! I did one of Lori’s tours but mine was a little different. In fact, I love that she mixes them all up so well. I’d totally be down for the Pisco SOurs and those curry meatballs. Nom! So bummed we didn’t get to meet up while you were visiting. 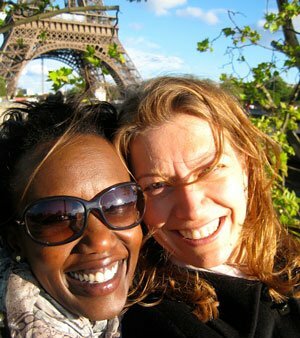 Lori’s tours are so much fun and chock-full of history and culture. Great fun and really delicious. Let’s catch up the next time we are in the area. Take care. What an amazing tour! I love the idea of combining food with history. Next time we are looking for an adult activity in Florida, we’ll definitely check it out. That’s awesome to hear that you’ll check out the Taste History Culinary Tour on your next visit to Florida. So you know, kids are welcome on the tour and depending on the age, it may be free for them. It’s a lot of fun and can’t wait to hear what you think about it! I have not heard of Floribbean cuisine, but I love mango salsa, conch fritters, and key lime pie, so I know I already like it. I would love to go on this food tour. The hubs would love the mac n’ cheese. Thanks, Lara, there are lots of yummy delicacies on this tour and you would love it. Learning about the food history and culture is fascinating and adds extra depth to the experience. Highly recommend it the next time you are in Florida. I have to shamefully admit, after living in Florida for 5 years, I had never heard of Floribbean cuisine! But it makes so much sense! What a fun tour too! We are currently traveling through South America so we might need to check this out after we get home for some serious cross over 🙂 Thanks for sharing! You are most welcome Kate and glad you learned something new about your hometown. It’s funny but some of the ladies on the tour with us, who are originally from Florida were also unaware of food and cultural variety in their own area. That’s the beauty of food tours 🙂 Safe travel in South America and you’ll have a great time comparing the food on your travels to the Floribbean versions. Don’t forget to come back and tell us about your experience on the Taste History Culinary Tours. I’d never heard of Floribbean cuisine before, but it really does make sense given the movement of populations over the last couple of hundred years. That culinary tour looks amazing! I wonder if they have them here in LA? What a fantastic way to get to know different styles and flavors. I am so on board with that BBQ place and the Latin fusion options. I’m not big on seafood, but my husband would pick up the slack there. This looks so fun and now I’m super hungry! Thanks for sharing! Great questions Patricia. If you do a simple Google search, you’ll find many food tours in Los Angeles. I’m not sure if any of them cover the cultural history and movement of populations over the years. However, when you find yourself next in Florida, take a tour with Taste History and enjoy sampling Floribbean cuisine. Thanks for stopping by! Awesome…you must have a pretty long list by now! Add this tour to the list of things to do and you’ll not be disappointed. My that looks and sounds like a grand tour. Love all the gallery art and the food is amazing. Now I know that Floribbean cuisine exists I’ll be looking for it when next in Florida. The blend of art, food and history make a tour with Taste History quite unique. Highly recommend this tour for your next trip to Florida. Cheers! I have not heard of Floribbean cuisine but like a lot of the foods mentioned. I have a friend who lives in the area, next time I visit we have a food tour to take! Hi Sherianne, highly recommend taking the tour on your trip to South Florida. You will love it because it puts the food that you already love in context. Bring your friend along… they will also learn something new 🙂 Please let us know what you think after you take the tour. Cheers. What a great tour to do. 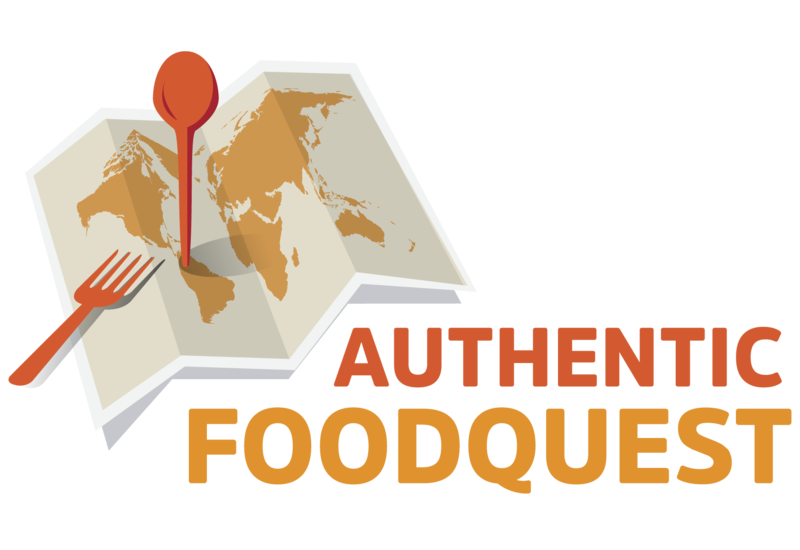 I love getting off the beaten path and eating delicious food so this tour sounds like a great mix! I don’t know when I’ll be in Florida but I will be looking into taking this tour if I end up down that way for sure! Thank you so much and glad you enjoyed reading about the tour. Indeed, off the beaten path places are so much fun to explore. When the local history is thrown into the mix it makes it that much richer 🙂 Thanks for stopping by. Awesome Fiona…yes copious amounts of delicious food. Don’t plan on eating before when you take the tour. Please do let us know what you think on your trip to Florida. Cheers. Thanks so much Cai for your feedback. Meeting the local chefs and cooks behind the food and hearing their stories is one of the aspects that made this tour so much fun. Glad you enjoyed the article and hope you get a chance to visit Florida soon. Cheers. This sounds gold! 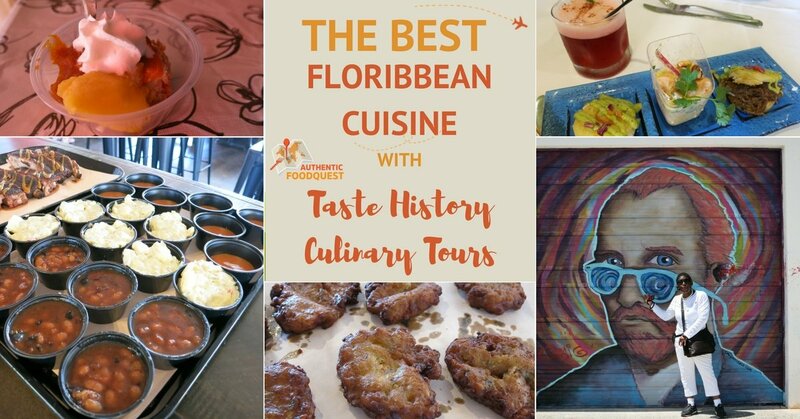 Recognise lots of the Floribbean dishes and definitely would have happily joined you on this tour. Pisco Sours, Conch Fritters, Arepas, BBQ ribs…. yum yum. Sounds like you visited so many restaurants / eateries in one day! You must have been stuffed. Also like a bit of history and culture mixed in with the tour. Thanks for sharing this. Thanks so much Guy for your comments. The food was amazing as well as learning about the history and meeting the chefs. 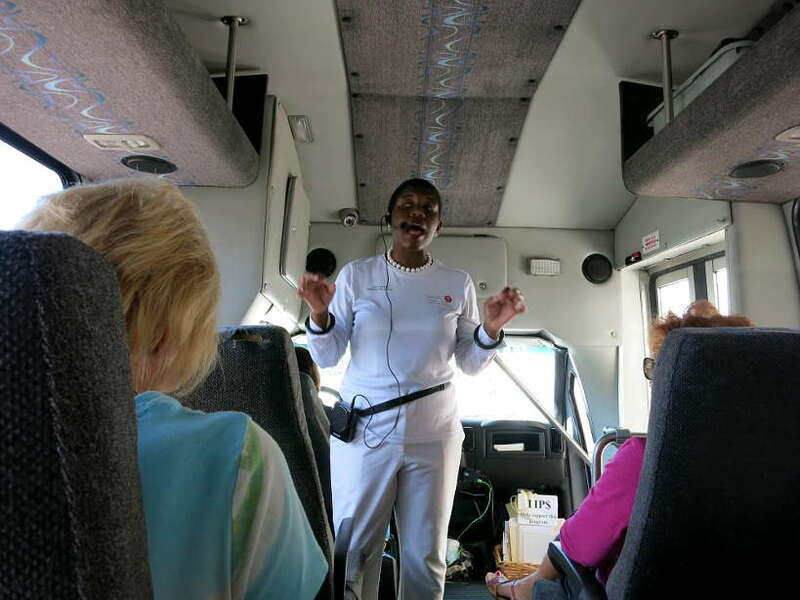 If you make it to Florida, we highly recommend taking a tour with Lori and Taste History Culinary Tour. Appreciate the comments, Guy! What a fun tour! This sounds like a great mix of culture and food. (Plus, some street art – what a cool mural project!) I’m a huge fan of Pisco Sours and BBQ so you’ve got me sold! I’ll definitely have to check this out! The tour was a lot of fun and the perfect combination of food, culture, and history. We highly recommend this tour on your next trip to Florida. Cheers! Everything is looking good Claire. I am a huge fan of key lime pie. It’s tough to find a good slice in these parts but sometimes I nab a solid one in a diner. Gotta get the tangy and sweet medley down proper as the mix makes the pie.